This grandiose machine allows our students to produce and integrate the idea of a sketch with production concepts. 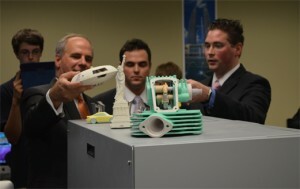 The outcome of the student work results in an actual 3 Dimensional model that is produced by the machine. Students then build a plan complete with a budget and then they market it if they choose to show others to see how it is interpreted. The 3 levels of curriculum are able to be built around opening up the high school mind to college level curriculum. Partnering with Philadelphia University, we have developed a relationship where students can allow their imagination to start with a simple chair design and expand to a spaceship. This concept intertwines business thinking, designing, modeling, and creating all in one core curriculum. Our students have the option of entering a Product Design Technical pathway in which they can hone their technical skills to combine creative ideation with 3 dimensional design. 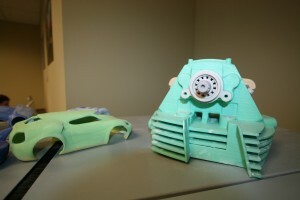 As an end product, the students will build their actual 3D product with our 3D printer and then create a business plan and marketing strategy for their unique product.